Heat oven to 375°F. Spray bottoms of 8 regular-size muffin cups with Crisco® Original No-Stick Cooking Spray. In 10-inch skillet, melt butter over medium heat. Cook and stir onions in butter 5 to 6 minutes or until softened. In medium bowl, beat eggs, liquid smoke and nutmeg with electric mixer on medium speed until well blended. Beat in cream cheese and sour cream until blended and smooth. Add onions and Parmesan cheese; mix well. Remove crescent dough from can; separate into 8 rounds. On floured surface, using rolling pin, roll each round to a 4 1/2-inch diameter. Press each into muffin cup. Spoon about 1/3 cup onion mixture into each cup; sprinkle each with 1/2 teaspoon chives. Bake 25 to 30 minutes or until custard center is set and edges are golden brown. Cool in pan 15 minutes. Run knife around edge of each muffin cup to loosen tart; remove from pan. Serve warm. 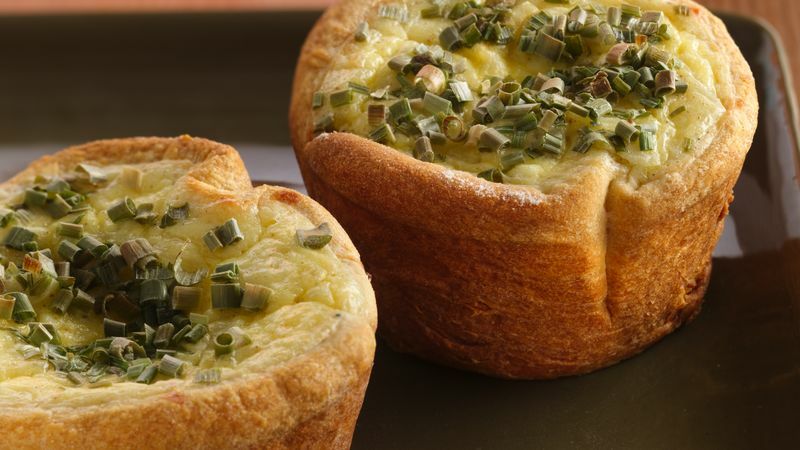 *Liquid smoke is key for the smoky flavor in these breakfast tarts, but they are equally delicious if you choose to omit it.